Moments ago, React Presents announced via a Facebook Live Stream their Phase One lineup for the 2017 edition of Spring Awakening. Headliners include Diplo, Marshmello, Jauz, Zhu, Krewella, AfroJack, Die Antwoord and more. Along with the already announced names, 60 more artists are set to be revealed soon. 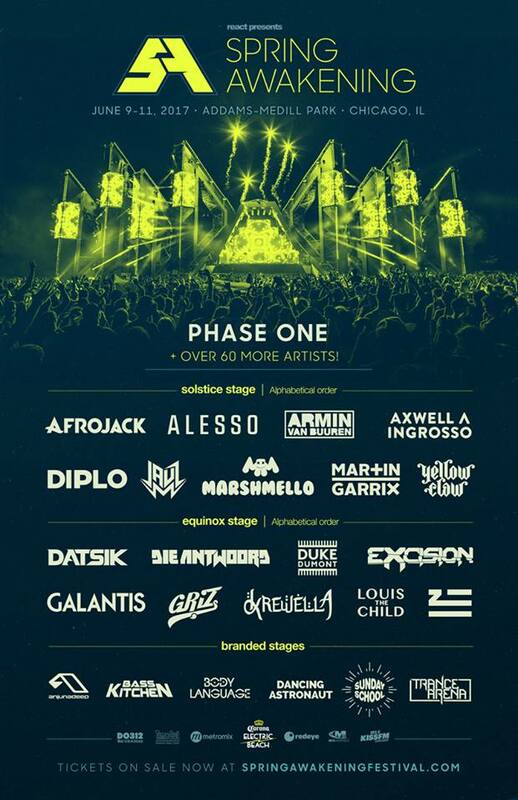 Spring Awakening adds BORGEOUS, Mr. Carmack, Keys N Krates, Robin Schulz, Ghastly, MALAA, HeadHunterz, Mija, What So Not, Vanic, TJR, and Alan Walker as part of the Phase Two lineup. If you missed out on presale tickets, 3-Day GA and 3-Day VIP tickets are still available. Spring Awakening is set for this summer taking place on June 9th– 11th at Chicago’s Addams/Medill Park. See my previous coverage and photos of last year’s Spring Awakening HERE.